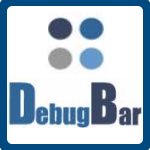 Menu to customize the DebugBar and check updates. IETester is downloading all the different engine versions at startup. Then for each tab, IETester keeps the version information and redirect dll/com calls to custom versions initially loaded.